Home » Health & Wellness » Healing Through Movements – Qigong, Tai Chi or Yoga? Qigong, Tai Chi and Yoga are movement therapies that heal body and soul. Qigong, Tai Chi and Yoga are techniques that you can learn together with an instructor and then do regularly on your own. 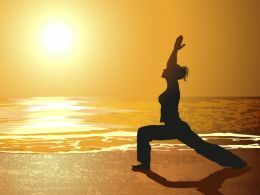 You will learn different movements, and some of the healing techniques also include breathing exercises and meditation. The three methods are said to provide increased body strength, flexibility, coordination and mobility. They also reduce the stress of everyday life and strengthen self-healing ability and confidence. But what’s the difference between Qigong, Tai Chi and Yoga? Let’s compare the three healing techniques and learn about their healing properties to find out which healing form is the best for you. The concept of Qi means vitality, and Qigong can be translated into “energy exercise”. When you learn Qigong you will recognize the feeling of Qi – your inner power and energy. Qigong consists mostly of soft and circular movements combined with breathing techniques based on breathing with your stomach. According to traditional Chinese medicine, Qigong can be used both to prevent and cure diseases. Physical therapists can teach you Qigong as a treatment against headaches, dizziness, fibromyalgia pain, social phobias and stress problems such as insomnia and anxiety. Chinese researchers have studied the effects of Qigong and discovered that Qigong can increase blood flow to the brain and thereby improve the body’s function. Tai Chi can be translated into “maximum force”. Tai Chi is a more mobile form of Qigong. The goal of Tai Chi is to provide a steady flow of life energy Qi. Tai Chi teaches you a series of positions which are carried out after each other in a slow sequence of dance-like movements. You can make a few movements, or a long series. Tai chi is primarily used to prevent illnesses, and is not used as a treatment for diseases. It is a gentle technique and suits both young and elderly people. Tai chi is considered to create a sense of calm and balance. Tai chi has been studied in the U.S and U.K. and the studies indicate that the method provides stress relief, and therefore can reduce stress problems. The Sanskrit word Yoga means “union” between body and soul. Yoga is a gentle form of exercise for the body and soul. There are many different kinds of yoga with different levels of physical activity. Some are physically strenuous while others are more focused on meditation. You may want to try a few workouts to see what type of Yoga that suits you the best. Yoga is used in many different problems such as stress, headaches, back problems, insomnia, depression, chronic fatigue syndrome, circulatory and bronchial problems, arthritis and menstrual problems. Yoga also helps to preserve harmony in the body and prevent illnesses. Studies have shown that Yoga has a positive effect on the heart and blood circulation. Studies also show that Yoga can provide relaxation, reduce pain and anxiety on stressrelated problems. Qigong, Tai Chi and Yoga are wonderful healing exercises for most people, but if you have symptom of any illness or a known disease, see a doctor before starting any exercise. After training you may feel stiffness and soreness or sensations of heat and cold, but this is usually just a sign that the healing works. These three healing exercises increase viability, vitality and sense of relaxation. Regardless of which spiritual healing technique you choose, you will feel better physically, emotionally and spiritually.